The lovely fast growing Metasequoia glyptostroboides is a deciduous conifer with brown red coloured bark and rich-green, feathery leaves which turn bronze-gold in autumn. Thought to have been extinct it was re-discovered in Western China in 1941, it is conifer species that has actually been on earth for many millions of years. 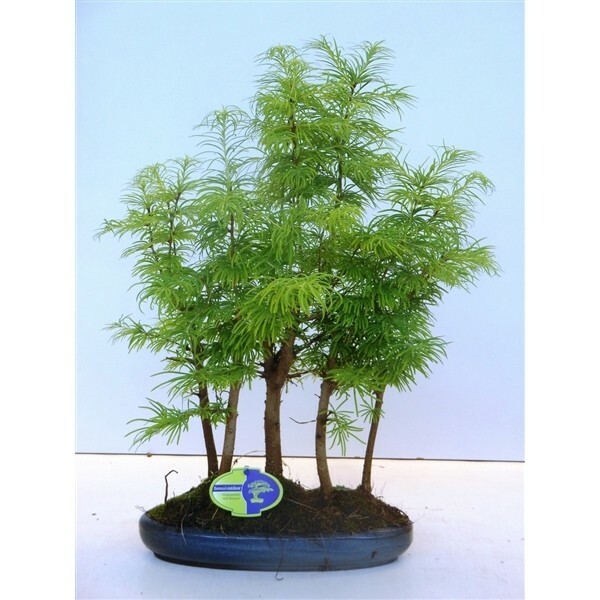 A special Bonsai for outdoor growing, it likes full sun and partial shade, and plenty of water during the growing season, prefering the soil in it's dish to be kept moist-wet at all times. Supplied at around 35-40cm in a nice ceramic dish (colour may vary).